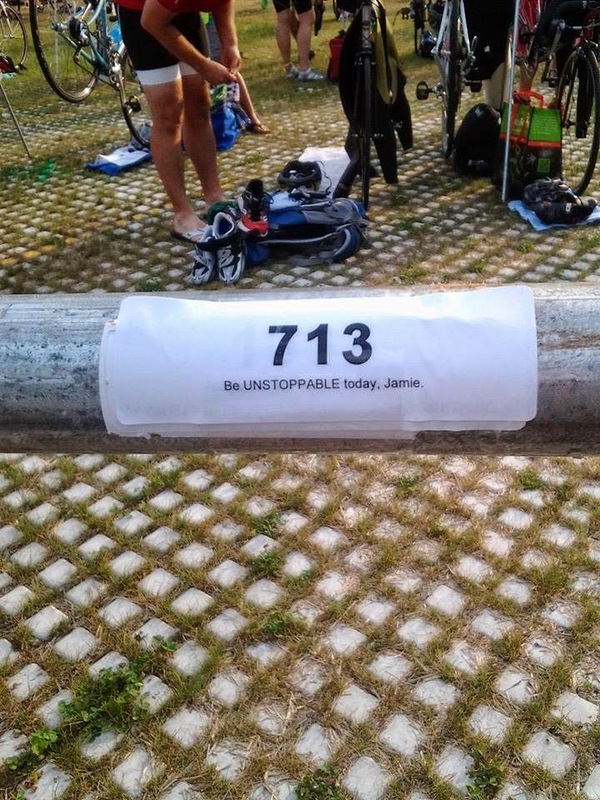 Last year, we raced Musselman as our first 70.3. I knew that this year I wanted to be a part of the Musselman weekend again, so we registered for the sprint on Saturday. I had wanted to do the Double Mussel, both the sprint and 70.3, but Mike wanted to do the Boilermaker 15K on Sunday so that's what we did as a compromise. We picked up our packets on Friday, but we stayed at our house the night before since the race didn't start until 9am. It is about an hour drive to Geneva so we left the house around 6:30am to give ourselves enough time to park, get body marked and set up our transition areas. Mike's parents made the drive to come cheer us on, our friends Rob and Greg (who raced the 70.3 yesterday and did an AMAZING job in tough conditions) were also there to support us and we had friends racing in the sprint as well. Mike and I got body marked quickly and then set up our transition areas. 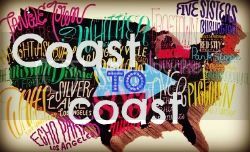 While doing that we saw our friend, Beth (who had just raced an Ironman two weeks ago, beast), and then later we saw our friends Sarah and Mark. All four of us would be in the same wave since they had men 25-29 and women 20-34 in the same wave. After making sure we had everything set up, taking a few photos and getting our wetsuits on, we made our way over to the start of the race. The race director made a few announcements and led a moment of silence for Michael Coyle and Lanlin Zhang, two athletes who died last year during the Mini Mussel and Musselman races, respectively. After the national anthem it was time to make our way over to the corral. We were in the second wave and they let us get in the water before the first wave went off. While waiting for the start of our wave, the wind kept pushing us in front of the buoys! We had to float in open water (or tread water if you didn't have on a wetsuit) for a few minutes before the start. Once the horn sounded, we were off! Since the swim was really short, only 750 meters, I took off at full speed. I could tell I was in the main pack of the pink caps, I knew Mike was ahead of me, and I just focused on giving it my all. The swim is in open water for a few minutes and then you enter the channel. This portion of the swim is warmer and has a lot more weeds! I got some stuck on me a few times but I didn't waste time trying to get them off and just hoped they would fall off of me. Luckily, they did. The first wave had on light blue swim caps, and before making the turn toward the swim exit I started to pass swimmers from this wave (they started five minutes before us). I couldn't tell how I was doing in my wave but I just pushed as hard as I could. When I saw the two buoys indicating the swim exit, I kept swimming until my hands hit the bottom twice (some people stood up really early, but I like to swim until I can't swim anymore since it is faster). As I ran out of the water, I could hear Greg and Rob cheering me on and then a little later I heard Mike's parents. Mike's dad told me to go get him (assuming Mike). And I ran into the transition area. I later found out I was 5th or 6th out of the water for pink caps (Mike was first) and I was second out of the water for female swimmers in that wave (ironically, the first female was in my age group). Before the race, I jokingly said that I was going to beat Mike out of the water since we were in the same wave (usually we aren't). We set up a bit of a competition with some people supporting "Team Jamie" and other people supporting "Team Mike". Whoever had the fastest swim plus T1 time would be the winner. Unfortunately, I let my supporters down but I'll get him next year! I quickly got my stuff on and then ran out of there to get on the bike. As I was leaving I heard someone say, "you're second female, go get her"! Even though I knew I wouldn't stay in that position, it was still nice to hear. The sprint bike course takes you out of Seneca Lake State Park and out onto roads along the east side of Seneca Lake. This year the section that had a carpet put down over it while we were exiting the park had been paved, so that made it a lot better! Admittedly, I do not like the first few miles of the bike course. The Mini and Musselman both start out the same way, and then the 70.3 course continues on along 96A. The first half of the sprint bike course has the majority of the hills, and this year we had a headwind to contend with. I just focused on keeping my heart rate down and trying to not get below 15mph too much. There was a lot of drafting going on out on the course (not me), even with numerous USAT officials out there (I saw them at least twice)! I kept playing tag with two or three other athletes. I would pass them on the hills and they would pass me on the flats/downhills. 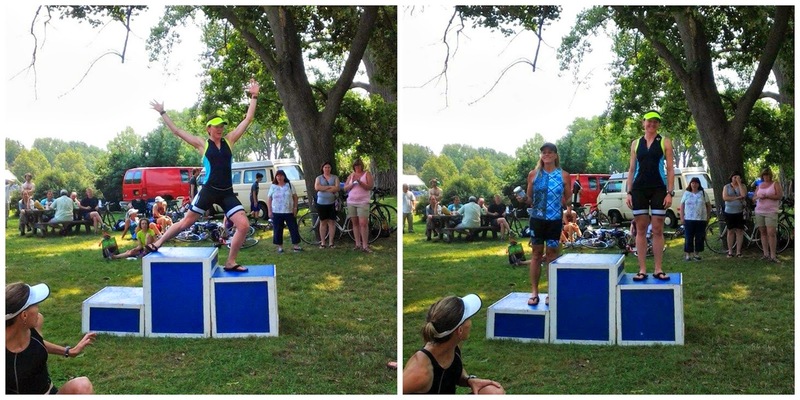 A few female athletes passed me out on the bike course, three at the most, so I knew I was still doing well for my age group (hard to always see the age on the back of people's calves so I wasn't entirely sure of my position). The first few miles were: 16.7, 15.5, 14.8, 18.6, 17.5, 15.5 and 14.5mph. I had looked at the course map and I knew that once we turned down Yale Farm Road and started to make our way back to the park, that we would be greeted with some sweet downhills. We also didn't have a headwind to deal with for the rest of the ride. I kept playing tag with a few other athletes and when we got on East Lake Road I knew this part of the course as well (it is the final part of the 70.3 bike course). It is helpful that we have ridden the course a few times in the race and on training rides. I took an energy gel around mile 14.5 because I wanted to give it some time to settle before the run. When I made the final turn to head back toward the park, I drank some water and then started to think about what I would have to do when I got back into transition. As I entered the park, I heard Greg and Rob cheering me on. I kept pushing until I had to slow down toward the dismount line and then got off of my bike. My final miles for the bike were: 18.6, 22.8, 20.8, 19.9, 17.7, 21.9, 21.3, 23.1 and 18.6mph (with 14.6mph at the end to transition). This was my least favorite part of the race. The swim in and bike in were the same chute and the mat was slippery! Plus we had to run over this weird cobble-like surface to get back to our transition area (and in bike shoes that is tough to do). I actually walked a little bit to be safe and to make sure that I didn't fall. 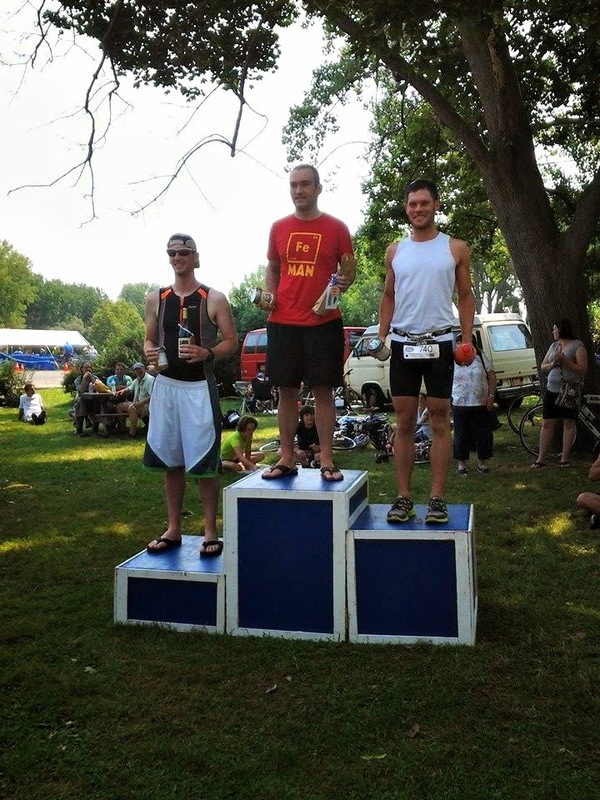 As I ran out of transition, I heard Rob and Mike's parents cheering me on and off I went to the flat run course. Rob ran over to see me one more time before I went off on the out and back course along the path within the park. I said to him, "this is why I hate sprinting" and off I went. As I made my way along the path, I then saw Greg and he cheered me on (along with a few other people who I didn't know, the benefit of having your name on your bib). When I got my watch to the screen where I could see my pace for the current leg I was on, I saw 6:24 pace. I told myself to calm the eff down and settled into a better (but still fast) pace. The first portion of the run course smelled HORRIBLE! The lake smelled disgusting in this part and it took a lot for me to not throw up (I don't handle smells well at all while running, biking, etc.) I tried to count how many females I saw out on the course, but I wasn't paying too much attention. I only was passed twice by women out on the run course. I knew I would see people out on the run course since it is an out and back, and I saw Eric, a guy that works at our bike shop, and I cheered him on as I ran by. The first mile came in at 7:33 pace, and I just told myself to keep pushing and that it was just a 3 mile run. I knew I would see Mike close to the turn around point, and right before it I saw him! We high-fived and I kept going on my way. As I approached the turn around point, there was a water stop and I took some water. I ran around the turn and back down to start the last half of the run. I grabbed some more water, took a small sip and dumped the rest on myself. Luckily, while it was hot, the sun wasn't out in full force yet. As I made my way down the course, I saw Beth and we high-fived! She looked great out there. A few minutes later I saw Mark and we cheered each other on. My second mile came in at 7:59 pace. I had slowed down a bit, but not drastically so I just kept forcing myself to run as fast as I could. I knew that in a few minutes, the pain would be over. Mike finishing up an amazing race! I had my pace under 8 minute pace right up until the very end, at which time I saw Sarah making her way out on the run course! She looked great and I gave her thumbs up as I pushed it to the finish line. I saw Greg and Rob cheering me on first, and then a few tenths from the finish line I saw Mike and his parents cheering me on. I ran as hard as I could to the finish line and I was done! My final mile came in at 8:05 pace and the last .2 miles came in at 7:25 pace. After finishing the race, I saw Eric and we chatted for a bit. Then Rob and I went over to find Mike and his parents. 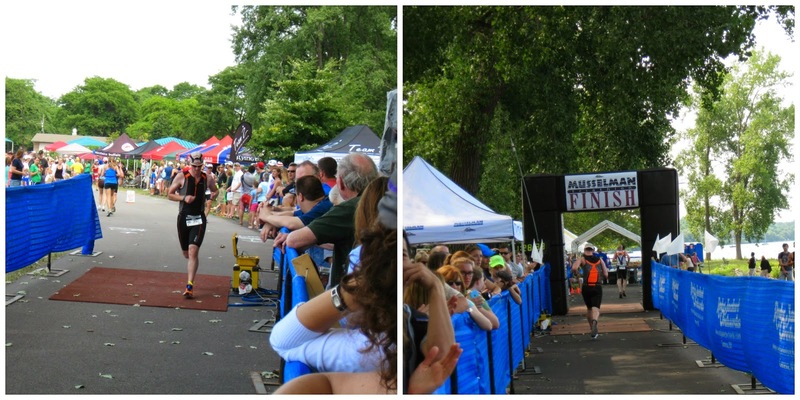 We missed seeing Beth and Mark finish their races, but we waited for Sarah to finish hers! After gathering our stuff from the transition area, we went over to look at the results and we found out that Mike had come in third in his age group (out of 27)! I had just missed placing in my age group by coming in fourth (out of 37). We hung around to see Mike (and Beth) get his age group award and then we packed up the car, had lunch and made our way to Utica for our second race of the weekend. Mike and I had an incredible day racing with friends and we are so thankful for everyone who came to support us at our race. We pushed ourselves (something we don't get to do, speed-wise, very often with Ironman training) and we did really well. I know we are only going to keep getting better and better! Yaya, nice work! That's a great tip you shared about the swim--swimming until your hands touch the bottom. I always keep swimming as long as possible. It's funny when you turn to breathe and there are people standing up and walking--and you're passing them! Congrats to both of you! You are beasts! 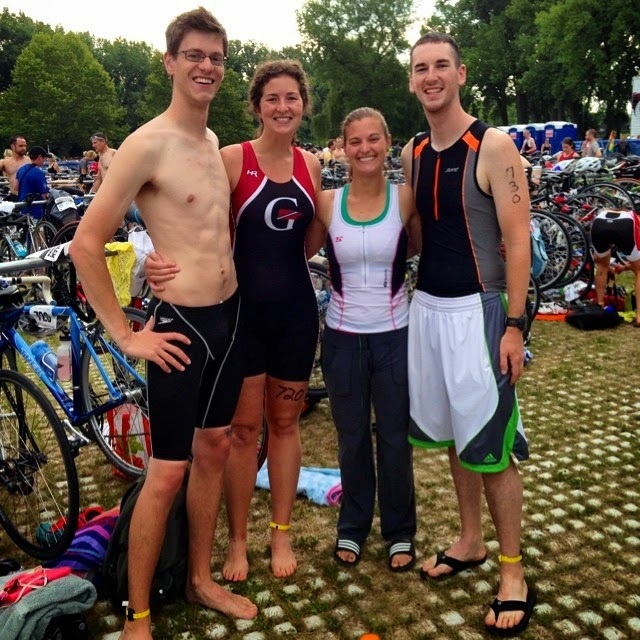 It's always nice to have familiar faces out there and we love racing with you guys!! We must get together soon! Wow. What an amazing run pace after all that! Soooo incredible! Awesome speed! Congrats to you both! Wow!! You both did so fantastic (and are SUCH speedy swimmers!) Congrats on the 3rd and 4th place finishes!